MALIBU, Calif. – A day after finding out their head coach was being let go, the Pepperdine Waves put up a fight against the BYU Cougars. 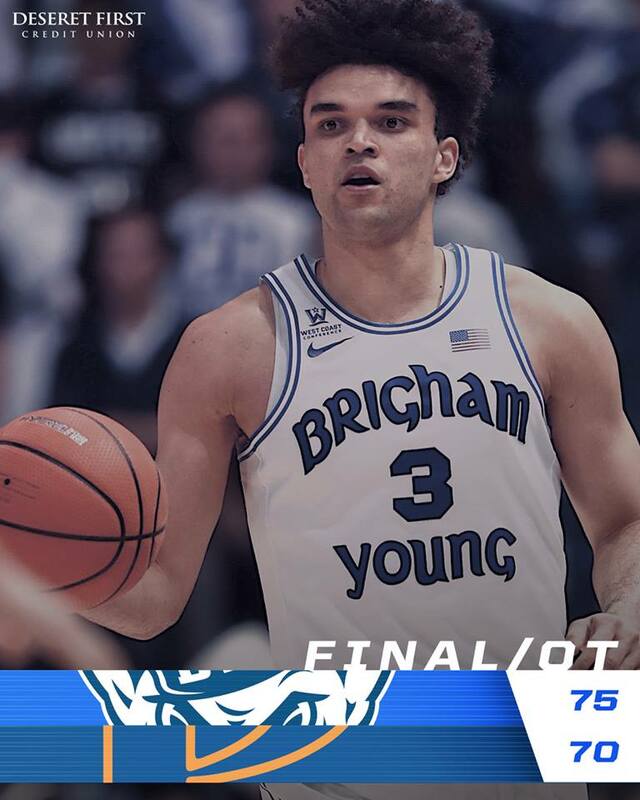 But Elijah Bryant lifted BYU to a 75-70 victory over Pepperdine in overtime at Firestone Fieldhouse Thursday night. Bryant scored nine of his team’s 11 points in overtime to give the Cougars the win. This is the first time BYU has won at Pepperdine since 2013. Waves coach Marty Wilson was informed his contract would not be renewed at the end of the season on Tuesday. Pepperdine is just 4-23 this season and conference-worst 1-14 in the WCC. Bryant ended the game with 25 points, eight rebounds and one assist. Yoeli Childs added 18 points, six rebounds, three assists, two blocks and two steals. Jahshire Hardnett contributed nine points while grabbing five rebounds. Dalton Nixon scored eight points and grabbed four rebounds while adding three assists and two steals. A pair of free-throws by Childs gave BYU the Cougars the first points of the night. Back-to-back treys by the Waves extended their lead to 6-4 before a Bryant layup evened the score with 17:08 remaining in the first half. After Pepperdine took a 9-8 lead, BYU scored four consecutive buckets from beyond the arc, three by Bryant and one by McKay Cannon, giving the Cougars a 20-15 lead with 10 minutes remaining until halftime. BYU went on a 6-0 run, including four points by Childs, to give the Cougars a 26-17 advantage with 7:35 on the clock. With 1:21 to go in the first half, two points from the charity stripe gave Pepperdine a 33-32 lead. A bucket by Hardnett returned the lead to BYU before a 3-pointer by Colbey Ross with eight seconds on the clock gave the Waves a 36-34 lead at halftime. Pepperdine shot 46.4 percent from the field in the first half compared to the Cougars 44.0 percent. Childs and Bryant both scored 11 points in the first half. The second half began with BYU going on a 5-0 run to take the lead back, 39-36. The Cougar lead was short lived as the Waves used a 7-0 run for a four-point advantage, 43-39 with 15:27 remaining on the clock. A bucket by Childs ended the Pepperdine run, but began a scoring drought for both teams for nearly three minutes. The Waves ended the drought, while back-to-back buckets by the Cougars brought them within one, 47-46 with 9:33 left in the game. Bryant converted at the free-throw line and Hardnett added a trey of his own, giving BYU a 57-53 advantage with five minutes to go. Pepperdine went on a 9-2 run, taking a 62-59 lead with 1:57 left in the game. A jumper by Childs and a block on the other end of the court gave BYU the ball with just over a minute to go and the Cougars down by one, 62-61. TJ Haws hit two free-throws and was followed by a defensive stop, resulting in the shot clock turning off and forcing the Waves to foul BYU. Bryant hit one of two free throws, extending the Cougar lead to 64-62 with 16 seconds remaining. Pepperdine’s Ross finished at the basket with seven seconds on the clock, tying the game at 64-all and sending the game into overtime. Both teams scored their first points in overtime at the charity stripe, keeping the game even at 66-all. A basket by the Waves was answered with a jumper by Luke Worthington, tying the game at 68-68 with 2:12 left on the clock. With just under a minute to go in overtime, Bryant converted on a three-point play to give BYU a 71-68 advantage. A bucket in the paint and another pair of free-throws by Bryant gave BYU the 75-70 win. At the end of the game, the Cougars improved their shooting to 46.3 percent from the field and held Pepperdine to 41.3 percent. The Cougars continue their final two-game road trip of the regular season at San Diego on Saturday, Feb. 17. Tipoff will be at 1 p.m. PST. Live coverage will be available on BYUtv and audio broadcasts can be heard on BYU Radio (Sirius XM 143), BYU Sports Network and Easy 101.5 FM in St. George. Elijah Bryant scored 25 points, his 11th 20-point game and 23rd this season with double figures. Bryant also hit three 3-pointers, his third straight and 14th game this season with three-plus 3s. Bryant has hit a 3-pointer in 27 of 28 games this season. Yoeli Childs scored 18 points to reach double figures for a 26th-consecutive game. He added two blocks, giving him multiple blocks for the 16th time this season. BYU won 75-70 in overtime at Pepperdine, its second-straight overtime win. It is the first time BYU has won consecutive overtime games since 2010. The last time BYU went to overtime in consecutive games was March 8 and 9, 1991 vs. Hawaii and Utah in the WAC Tournament.